Vesnianky-hahilky (also known in Galicia as haïvky, iahilky, hahulky, halahilky, iaholoiky, maivky, and rohulky). Ritual folk songs sung by girls in conjunction with ritual dances and games from early spring until the Feast of the Holy Trinity, particularly at Easter. In some regions they were sung only at Easter. They were performed in the village street, churchyard, cemetery, or pasture. Originally their purpose was to persuade the mysterious forces of nature to provide the people with a bountiful harvest and a happy life. The magical function of the songs was eventually forgotten, and they became entertainment. The vesnianky season opened as a rule with a farewell to winter, which took place on Candlemas, the day marking the meeting of winter and summer and their strength, or at the first sighting of migratory birds. A straw or wooden image of winter called Smert (Death), Mara (Specter), or Kostrub (Slob) was burned or drowned to the singing of vesnianky, and then spring, sometimes personified by a girl in a flower and herb wreath, was welcomed with ritual dances, such as Mosty ‘Bridges’ and Vorotar ‘Gatekeeper’. The dialogue, ‘O Beautiful Spring, what have you brought us?’ ‘I have brought you summer, a pink flower, winter wheat, and all sorts of fragrant things,’ was sung. In some localities bird-shaped bread was baked and tossed by children into the air to represent birds in flight. Many vesnianky were addressed to birds, groves and woods, and trees and flowers, asking them to assist the coming of spring (see Spring rituals). The oldest vesnianky are those associated with ritual portrayal of plant growth and farm work (Mak ‘Poppy’, Proso ‘Millet’, Ohirochky ‘Cucumbers’, Khmil’ ‘Hops’, Khrin ‘Horseradish’, Hrushka ‘Pear’, L’on ‘Flax’) and the behavior of birds (Horobchyk ‘Sparrow’, Soloveiko ‘Nightingale’, Husky ‘Geese’, Kachky ‘Ducks’, Kachuryk ‘Drake’), animals (Vovk ‘Wolf’, Lysytsia ‘Fox’, Zaichyk ‘Bunny’), domestic animals (Baran ‘Ram’, Kozel ‘Goat’), and insects (Zhuk ‘Beetle’). Most of the vesnianky that have survived include motifs of courtship, the invitation to dance, female charms, true love, and the marriage proposal, but they also include mockery and satiric couplets about young men and women. These songs are of more recent origin. Sometimes they are accompanied a dance or game. Their purpose is to attract young suitors. These vesnianky are closely related to wedding songs and lyrical songs; they are a kind of prologue to forthcoming weddings. Many of them contain echoes of ancient family and social practices, such as the abduction and ransoming of girls, and the decisive role of the girl's mother in the setting up of the marriage. Some vesnianky contain references to the Princely era, mention of Dazhboh, images of Prince Roman Mstyslavych, talk of tribute in honey, and battle accounts. The Cossack era is depicted in many songs about the wanderings of the peasant Cossacks, the campaigns, the Cossack's separation from his beloved, and various Cossack exploits. The genre reflects many historical periods and often deforms the concrete details. Some vesnianky, such as Dunai, Vorotar, and Mosty, originated in Western Europe and were brought to Ukraine. The songs are rich in imagery, associations, antitheses, similes, and especially psychological parallelism. The simple but moving melodies have a deep rhythmic structure punctuated with frequent exclamations. 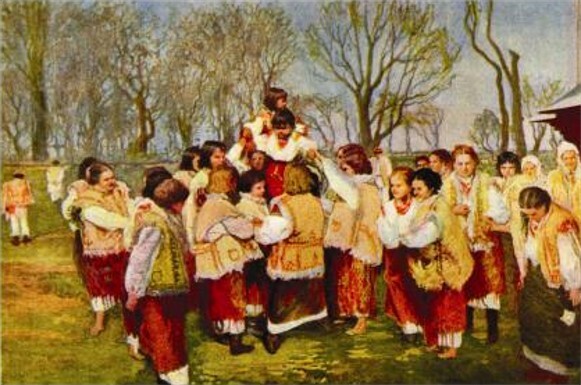 Ryndzivky, a form of vesnianky, were sung at Easter by young men in the Yavoriv area in Galicia. In Soviet Ukraine the vesnianky began to disappear after the Revolution of 1917 and were completely gone by the end of the Famine-Genocide of 1932–3. In Ukraine today they are sung only by professional and amateur ensembles. In the Ukrainian communities of Western Europe and North and South America they remain a part of the Easter celebrations. They continue to be performed by young people in the churchyard after the blessing of the Easter bread. The vesnianky began to be recorded systematically only in the mid-19th century. They can be found in almost every song collection: there are 91 in Yakiv Holovatsky's Narodnye pesni z Galitskoi i Ugorskoi Rusi (Folk Songs of Galician and Hungarian Ruthenia, 1878) and 184 (and 108 melodies) in Volodymyr Hnatiuk's Haïvky (1909). To date the fullest collection is O. Dei's Ihry ta pisni (Games and Songs, 1963), which contains 368 texts and 129 melodies. The vesnianky had an important influence on the development of lyric poetry in Ukrainian classical literature (Hryhorii Skovoroda, Markiian Shashkevych, Taras Shevchenko, Ivan Franko, Lesia Ukrainka). In music they were exploited by Petro Nishchynsky, Mykola Lysenko, Mykola Leontovych, Stanyslav Liudkevych, and others. They were presented on stage in the ethnographic-realist plays of Mykhailo Starytsky and Ivan Karpenko-Kary and were depicted on canvas by Ivan Trush, Olena Kulchytska, Yaroslava Surmach-Mills, and others. In recent times they have made their way onto film and television. In 1988 Czechoslovak television filmed Lety mii vinochku (Fly, My Wreath), with screenplay by Mykola Mushynka, based on the Ukrainian vesnianky of the Prešov region.